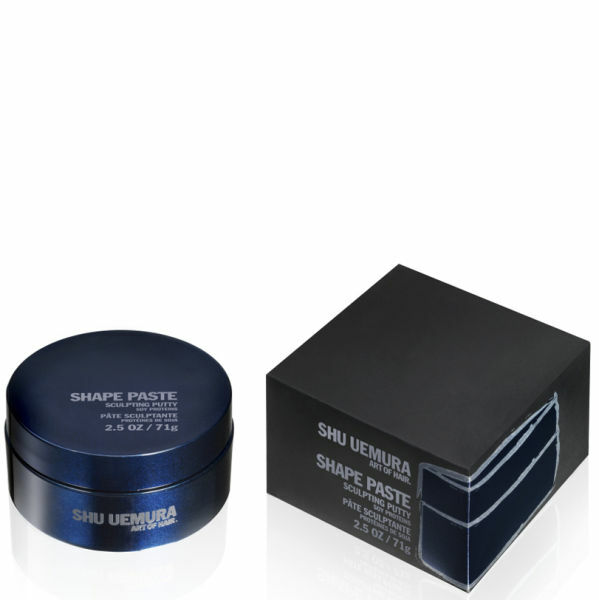 This Shu Uemura Art Of Hair Shape Paste is one of the powerful design tools that make up The Art Of Style range, helping to protect from heat, humidity, UV rays and environmental aggressors. A sculpting putty with workable hold, this Shape Paste gives the hair definition and moldability. Emulsify a small amount in hands and apply to damp or dry hair. Aqua / Water, Cera Alba / Beeswax, Paraffinum Liquidum / Mineral Oil, Cetearyl Alcohol, Bis-Diglyceryl Polyacyladipate-2, Tribehenin, Ceteareth-33, Propylene Glycol, Pvp, Vp/Va Copolymer, Peg-40 Hydrogenated Castor Oil, Parfum / Fragrance, Phenoxyethanol, Polyquaternium-11, Methylparaben, Aminomethyl Propanol, Acrylates/C10-30 Alkyl Acrylate, Crosspolymer, Benzoic Acid, Propylparaben, Limonene, Benzophenone-4, Simmondsia Chinensis Oil / Jojoba Seed Oil, Hydrolyzed Soy Protein, Ethylhexyl Methoxycinnamate, Caprylic/Capric Triglyceride, Alpha-Isomethyl Ionone, Benzyl Benzoate, Hydroxycitronellal, Linalool, Citral, Geraniol, Citronellol, Camellia Sinensis Extract / Camellia Sinensis, Leaf Extract, Crithmum Maritimum Extract, Bambusa Vulgaris Extract, Sodium Hydroxide. After using different kinds of muds, waxes en putties I finally found it. This product doesn't make your hair heavier of greasy. You just form your hair the way you want it, and it stays. Almost like it's been shaped by wind. Ok, it's kinda expensive, but you don't need a lot and I really don't like bad greasy feeling or looking hair.